Every year some hectares of farmland disappear in favor of urban area extension (85% of the French population lives in urban areas. Source: INSEE). In response of this context, five friends founded Clinamen Association in 2012 Saint-Denis. They wanted to reintroduce farmer practices in the urban spaces through transhumance, henhouse, vegetable garden, etc. 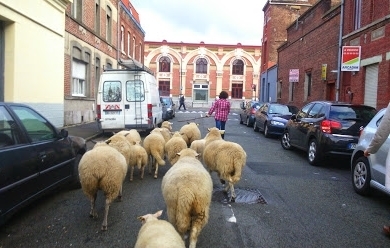 In 2014, Clinamen created the cooperative Les Bergers Urbain with the will to become a research and de-velopment center on urban agriculture. Les Bergers Urbain aims to assist the citizens (residents, donors, local businesses) to practice new ways of managing outdoor areas. – Valentin Charlot and Pauline Maraninchi, landscaper DPLG. – Julie Lou-Dubreuilh, architect and construction manager. – Guillaume Leterrier, territorial ESS developer. – Simone Schriek, osteopath DO-therapist. If the project initiators do not explicitly refer to design as such, the design thinking approach can be under-lined. The city is perceived as an ecosystem where urban planning is connected to food producing facilities and qualities of public space.